Without a doubt this wine producing village is a 'must' for all visitors coming to the Middle Rhine. The centre of the village of Bacharach with its remarkable half-timbered houses, lies behind medieval ring walls, built before 1344 and preserved until today. The towers are encircled by the Rhine and are connected by a roofed battlement, which provides visitors with a fascinating walk through past centuries. The three existing city gates form part of the ring wall system and are an essential part of the unique character of this city. The Münz Gate lies North, the Market Gate in the middle and the Krahn Gate is close to the medieval market and the Palatinate customs' office. Here, goods travelling down the Rhine were packed unto bigger ships after passing the shallow waters at the "Binger Loch". The medieval Bacharach was a central trading and distribution point for wine and wood at the middle of the Rhine due to its infrastructurally advantageous location and storage halls. Furthermore, the Bacharach customs formed a continuous source of income for the ruling class. 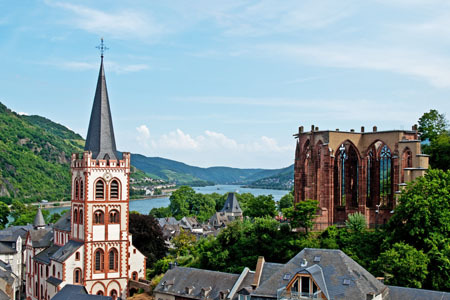 Because of its prosperous economy, Bacharach was accepted in the "Rheinische Städtebund" by 1254 and received its city charter 100 years later. As a result, the Guilders and Hellers of Kurpfalz were made alongside the "Old Coin" since 1356. After the removal of the Rhine customs in the first half of the 19th century and the associated loss of trading restrictions, Bacharach remains an important trading point for wine. However, economic activity shifted towards tourism, facilitated by the discovery of the "romantic Rhine" by the English, and the opening of the "Binger Loch". Another site well worth seeing is the "Old House" built in 1568 at the market square, with its half-timbered and corner windows, oriels and gables. The houses stand very close to each other, as the narrow Steeger valley with its steep slopes does not leave very much space. The Peter's Church is perfectly integrated within this narrow network of alleys and its oldest, late romanesque parts date back to the 12th century. Bacharach is towered over by the high gothic Werner chapel, which was in construction by 1287 and has a trefoil (clover leaf) floor plan. Local legend describes the building as atonement for the murder of a boy from Oberwesel whose body washed ashore in that same year. Work on the chapel was faltering with the bulk of building works taking place in 1426. However, the chapel was never completed. At the end of the 18th century the vaulted ceiling and roof had to be removed due to disrepair and the Chapel was constructed in its current form. The Werner chapel is counted among the finest structures of Rhenish gothic style with Strassburger tracery. It is likely to have been built by master builders from Cologne. Because of its fine and elegant appearance, even as a ruin, the chapel became a symbol of the romantic Rhine. Stahleck Castle is one of the most famous medieval Rhine castles and stands above Bacharach. It is the former seat of the Rhenish Earl Palatine. The region saw endless rivalries between the Guelfs and Staufers but in 1194 love triumphed when the niece of emperor Barbarossa secretly married the son of Henry the Lion against his father's will. Unsurprisingly, this caused a great deal of anger as for once the cold power politics were outsmarted. Interestingly, despite the high location of the fortress it was integrated into the town wall. Like so many other fortresses of the region, Stahleck was occupied by the French in 1689 and detonated afterwards. Less than 100 years ago the fortress was rebuilt to its current form. Today, it boasts one of the best youth hostels in Germany, with thousands of people from all over the world visiting each year. The most beautiful view over the city is not so well known by tourists and can be found from Bacharach's "Pfostenturm". This has been rebuilt upon its original foundation walls among a steep vineyard opposite to Stahleck fortress. The sheer slopes of the vineyard are hard work for both visitors and workers alike. However, having achieved the climb, the village can be seen below and the tower of the late Romanesque Peter's Church and the Stahleck fortress are within reach.